GREAT GETAWAY APARTMENT WITH STUNNING VIEWS ON THE COSTA BLANCA. Private Apartment with Large Terrace. Spectacular Mountain and Sea Views. Casa de Limones is a luxury self contained two bedroom apartment with own large terrace located on the Costa Blanca. The apartment and terrace both enjoy stunning mountain and sea views extending as far as Denia on the Mediterranean Coast. It is ideally suitable for couples who seek an active walking holiday or would like a relaxing tranquil base away from the hustle and bustle of the coast, although the port of Denia with its beautiful beaches, shops, restaurants, bars and nightlife is just a short distance away. The spacious apartment has its own private entrance, sleeping two people, and has recently been refurbished to a high standard. Throughout the apartment there are fly screens fitted to each window, ceiling fans in the bedrooms and a large floor fan for the summer months. The modern kitchen has a breakfast table for two and is fully equipped with a built in oven, gas hob, microwave, fridge/freezer, coffee machine, electric kettle and toaster. In the sitting room there is a comfy L-shaped sofa with matching armchair and a dining table for four. For your enjoyment there is a flat screen TV which has UK and Spanish TV, free WiFi, a DVD player with DVD's, a radio and a good selection of books and board games. There is a choice of sleeping either in the master bedroom where there is a romantic ‘Louis 14th’ double bed or there are twin beds in the second bedroom. In the bathroom there is a built in tiled shower area, modern sink unit, WC and a washing machine. For the colder winter months there is a cosy wood burning stove in the sitting room and gas central heating throughout the apartment. (Please note there is a small extra charge of Euro 8 per day for the gas central heating from the beginning of December until the end of March). Outside on the beautiful terrace area you will find an attractive metal gazebo with a comfortable outdoor seating arrangement which creates ample shade if required. There is also a mosaic table for four to enjoy al fresco dining, sun loungers and an extra parasol for your use. The terrace overlooks a pretty Mediterranean garden below with its lemon trees (lemons available for your use when in season). Although the apartment does not have a swimming pool there is an excellent outdoor local municipal pool during the summer months with a popular outdoor bar, just a 10 minute walk away. A welcome pack is provided as well as bedding and towels (please bring own beach towels). Fresh bedding and towels will be provided each week for weekly stays. Valencian Tourist Registration No: VT/100718/A. We are an active couple who likes to travel which we have done extensively in the past throughout the world and with our caravan throughout Europe and of course Spain. When we came to Spain in 2005 in our caravan, we fell in love with the area of the Costa Blanca North as it is very green all year round, great climate, beautiful scenery and friendly people. We firstly stayed in the beautiful Vall de Laguar campsite in Campbell for three months, and from there we decided to buy our first house in Orba, where we lived happily for 12 years. 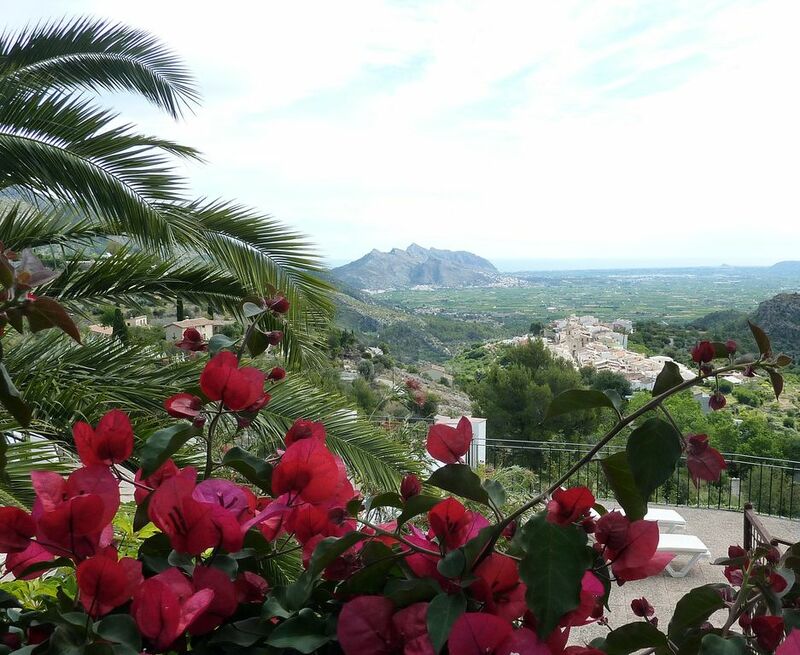 Then just one year ago we had the opportunity to buy our dream villa in Vall de Laguar which has magnificent mountain and sea views as far as Denia on the Mediterranean Coast. To this day we sometimes cannot believe how lucky we are as the views from our villa are truly stunning. Each day there is an ever changing view from dawn to dusk which we never get bored with. In the evening the whole of the valley sparkles as it gets dark, as well as the majestic village of Campbell, which you can see directly below the property. We chose this property in Vall de Laguar for its stunning views, tranquil location and being in a very Spanish area. The property stands in its own terraced plot with uninterrupted views and an established Mediterranean garden on the lower terrace which has many different fruit trees. Our property is nicely situated as you can do many walks in the area. The apartment has its own private entrance and private terrace where you can enjoy complete privacy and of course the magnificent views. In the summer (and winter months) you can enjoy sitting on the attractive terrace overlooking the whole of the valley enjoying a glass of wine (or two) or dining al fresco. The village of Campbell is a short walk away where there is a butcher, bakery, chemist and two local bars where you can eat Spanish tapas and meals with wine for a very reasonable price and sample the real Spanish life. There are also weekly vegetable markets in the area within walking distance. We are not very far from the Mediterranean coast, the closest being Denia which is our favourite coastal resort where there are many shops, good beaches, bars and restaurants. The unspoilt beaches of Oliva are also a stone's throw away. The AP7 motorway is conveniently close by where you can get to other areas of the Costa Blanca (or further afield) easily. A day trip to Valencia is a must see (which we often do) and is easily accessible by driving to Xeraco where you can park your car for free and go by train to the Centre of Valencia. Access to our property is via all good roads. Spacious bathroom with built in tiled shower enclosure and contains the washing machine. An additional winter fuel charge for the gas central heating of Euro 8.00 per day from the beginning of December to the end of March applies. For stays of more than one week, fresh linen and towels will be provided each week. Towels are provided but please bring own beach towels. A free Wifi connection is available. Wood provided at cost price. The living room is very spacious with a wood burner and for the summer a large floor fan is available. There is a large picture window patio door leading onto the terrace. Herbs, spices and olive oil. Welcome pack includes sugar, coffee, water, biscuits, bread, jam, etc. Newly refurbished kitchen with all new appliances. A breakfast table for two looking out to the magnificent view. A dining table for four (extendable to six) is located in the sitting room. Flat screen TV with British TV and Spanish TV. Sky satelite TV with freeview channels are available. A good library of books available. A selection of games are available. Boat rides along the coast are available in Denia. Large private terrace with magnificent mountain and sea views. There is a public tennis court close by. Nearest golf resort is La Sella, Denia. There is a beautiful municipal pool available 500m away during the summer months with an outdoor bar (bar also open in the evenings). We were fortunate to book this apartment for a weekend stay while exploring the area. It is an absolute gem and really I am loathe to tell others about it as I would like to keep it to myself ! I don`t know where to start. The hosts are genuine, lovely people with such a good knowledge of the area, in fact everything is written in a big file to tell you everything about the apartment and the surrounding areas. The apartment itself has it`s own entrance, an amazing terrace with a great view down to Denia on the coast and beyond and a sense of tranquillity. The 2 bedroomed apartment itself has a well equipped kitchen, lovely living area, bathroom and 2 roomy bedrooms. All the furniture is modern and tasteful and has everything you would need for an enjoyable stay. Even though it is quite high up there are plenty of places to walk to including a couple of villages within easy reach. All in all, a well thought out, considered apartment that I would recommend. Thank you for your review. We are glad that you enjoyed your stay with us and to hear such good things. Hopefully we will be able to accommodate you again in the near future. Best wishes. The area of Vall de Laguar is renowned for its tranquil beautiful mountain scenery that is very popular with walkers, cyclists and nature lovers. There are many spectacular walks to do in the area directly from the apartment or just relax on your own private terrace and marvel the spectacular views. It is an ideal base to discover the area of the Costa Blanca, both inland and along the coast. The nearby coastal resort of Denia, which you can see from the apartment, has many good beaches, bars, restaurants, shops, and a bustling nightlife. If you prefer quieter beaches then the unspoilt golden beaches of Oliva are just a stone’s throw away. A little further afield, Javea, Moraira and Calpe are also good coastal resorts to visit. Vall de Laguar consists of four villages: Fontilles, Campbell, Fleix and Benimaurell. Each village having its own charm. Fleix (where the apartment is situated) has an excellent outdoor local municipal pool with a popular outdoor bar during the summer months. In the village itself, there is a good local bar which is very popular with walkers on the weekends. The area of Fontilles is steeped in history and was a former leprosy colony. It is a very large secluded walled area with magnificent buildings and is very popular with walkers and tourists alike. The picturesque village of Campbell (a 10 minute walk away from the apartment) has two good Spanish bars where you can sample Spanish tapas or meals on their outside terraces and experience Spanish life. There is a pleasant walk from Fleix to the top village of Benimaurell through stunning mountain scenery where you will also find a good selection of restaurants and bars. Throughout the summer there are many fiestas to enjoy, each village having its own fiesta at different times of the year to choose from. During the month of April the whole of the valley is covered in cherry blossom as Vall de Laguar is the main cherry producing area of Spain. When the cherries are ripe in May there are many roadside stalls in the villages selling cherries and people come from afar to buy them. The local cherries are considered to be the best in Spain. Closer by, the beautiful Jalon Valley also has many good walks and is very popular to visit in February as the whole of the valley is covered in Almond blossom at that time. On Saturday mornings throughout the year there is a very large popular Rastro market to visit. The apartment is gas centrally heated and during the winter months from the beginning of December to the end of March there will be an additional winter fuel charge of Euro 8 per day. For stays longer than one week, fresh linen and towels will be provided each week.